Back in November 2016, Bing Ads announced an update to Device Targeting by adding Desktop as a new option, broadening bid modifier ranges, and allowing complete opt-out for Tablet. 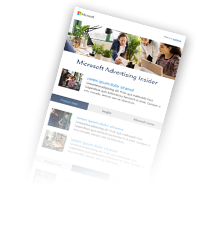 Since that time, we have received a lot of feedback to support an easy set up for mobile-only campaigns and tomorrow, Bing Ads is excited to announce an updated Desktop bid adjustment to meet this need. Advertisers can completely opt out (set to -100%) from displaying ads on Desktop. The new range for Desktop is now in-line with the rest of the devices at -100% to + 900%. This new feature will be available through all endpoints: Bing Ads Web Interface (including Google Import), Bing Ads Editor (Mac and Windows), and Bing Ads API. As part of our global rollout, some customers will start seeing the new Desktop bid adjustment tomorrow, and all customers will have this new feature within the next few weeks. NOTE: Advertisers can leverage Import from Google AdWords for their device bid adjustments going forward since Bing Ads will have the same values as AdWords. You can always reach us on Twitter and our Feature Suggestion Forum with your ideas, comments, and suggestions.